Four months into my foundation training, I have noticed a lot of situations keep cropping up day after day. 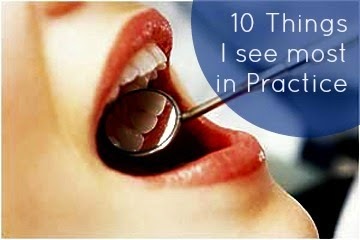 Here are the top 10 things that I have been seeing in practice. I would say that the majority of patients complain of some sort of sensitivity in one form or another. Common triggers include cold, hot or sweet foods and drink, or even sucking cold air through their mouths. There are a lot of factors that contribute towards sensitivity, including food packing, caries, cracked tooth syndrome but the majority I see are dentine hypersensitivity as a result of gingival recession around the cervical areas of teeth; either as a result of toothbrush abrasion or periodontal disease. I always tend to manage these lesions as conservatively as possible, starting with the application of fluoride varnish and prescribing either duraphat toothpaste or one of the sensitive toothpastes (I quite like Colgate Pro-relief) and keeping on review to see if there is any improvement. Only if there is no improvement I would then look to placing restorations - failure rates are quite high (I am currently looking at this for my Evidence Based Dentistry project that I'm working on). I would also attempt one of the resin sealers such as Seal and Protect which contains triclosan and also releases fluoride. When a patient does not report any improvement, upon questioning a lot of them have not be regularly applying the toothpaste topically to the areas of sensitivity - when they comply with my instructions, in most cases this approach works. In hospital you see patients for a relatively short period of time and there is little continuation of care, whereas in practice you can get to see patients who have attended there for many years so you can monitor restorations and treatments which have been placed previously. 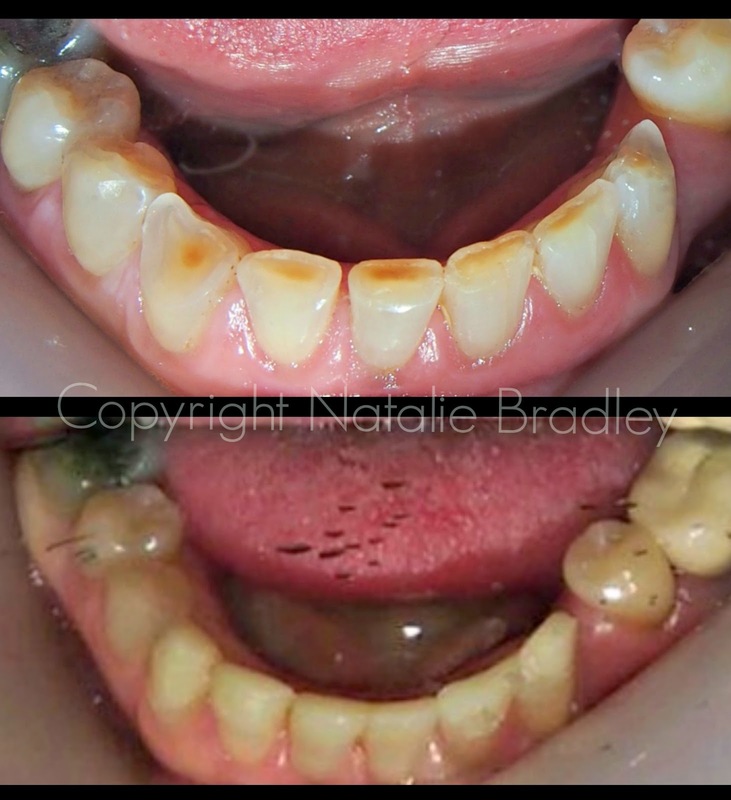 I have been seeing a lot of chipped or broken teeth, the majority of them having been restored with amalgam. Unfortunately, the part of the tooth that fractures doesn't tend to be the filling, but more often than not, a cusp of the remaining tooth tissue. 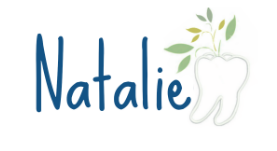 This underpins the idea that the best material to have in your mouth are teeth - not fillings or crowns or implants. Once you place a restoration in a tooth you are starting a timer to how long that tooth will last. That filling will eventually fail, then you'll have to place a larger filling, which may fail too and then you may need some extra-coronal restoration of some sort and when that fails the tooth may not even be savable at all. Whilst I do really enjoy working with amalgam, the downside is that essential, the filling will probably last longer than the tooth it's in. Probably as a result of dentists placing post crowns on teeth that are unrestorable due to a lack of ferrule (see my previous post which explains what ferrule is). 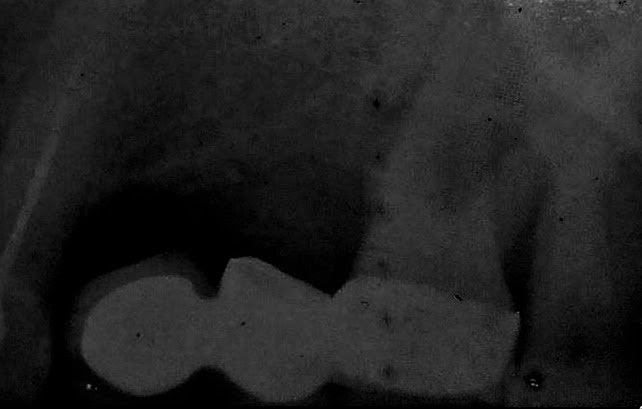 The majority that I see end up being unrestorable anyway as a result of a root fracture and multiple debonding of a post crown suggests a fracture of some sort. The main problem I experience as a result of this is a VERY difficult extraction. Sometimes the root fracture extends very unfavourably subgingivally and the roots tend to be very brittle anyway due to the fact they have been endodontically treated. I've already had a couple of cases where I've had to refer after a failed attempt at extracting the root remnant, despite mine and my trainer's best efforts! Remember when you first saw a torus in real life? Did it gross you out as much as it did me? And how much of a big deal did you make of it when presenting to your supervisor? I see tori all the time! Mostly mandibular tori more than palatal. These bony exotoses only cause issues when constructing dentures, although sometimes they do tend to get in the way when taking bitewings or when making an impression (sometimes they stop the tray from fully seating). Being used to using GIC like Fuji at university, I was quite surprised the first time I asked for GIC my dental nurse pulled out a bottle full of silver powder. The silver (or silver amalgam) in the GIC reinforces and improves the mechanical properties of the GIC and also makes the material radiopaque. It's a nice material to work with and is handy for repairing small chips in amalgams or as a long term provisional material in posterior teeth. Literally SO many people have tooth wear and most of the time it's multi-factorial. 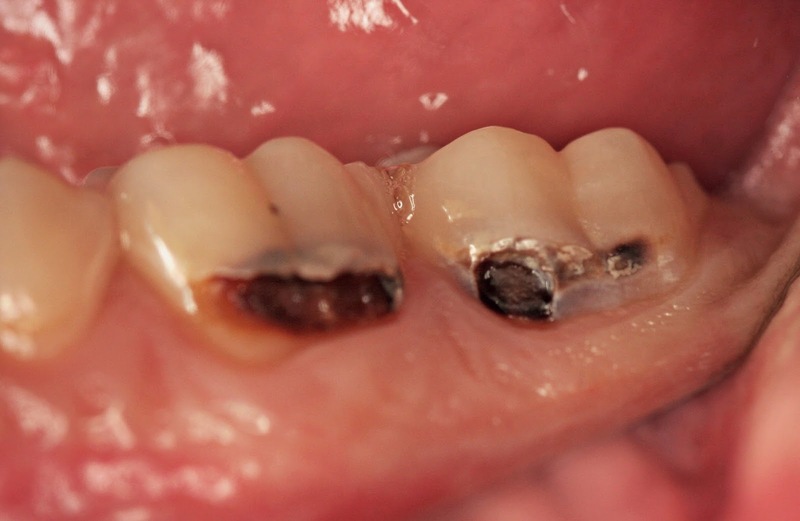 The most common causes include brushing too hard (leading to abrasion lesions), grinding their teeth at night time (leading to pictures like below, attrition) or drinking too many fizzy drinks or fruit juices (erosion). I have seen a couple of interesting erosion cases, one being a bulimic patient who was also a bruxist (nightmare combo) and another guy who upon questioning, revealed he liked to drink cider vinegar! The difficulty I find is knowing when to intervene and provide treatment for these patients. For a lot of them, this will be the first they've ever heard of suffering from tooth wear and some aren't very receptive to the idea of a mouthguard to wear at night or get defensive when you ask about their diet habits. In this attrition case below I managed the wear with composite build ups that I had used a putty matrix made from a lab wax up in order to help me create a stable occlusion and a good aesthetic result the patient was very happy with. The worse cases are in smokers and heavy coffee drinkers! Over time composites will pick up marginal staining, which can be made worse if you use a bonding agent instead of a wetting agent in finishing composites (see my previous post about composites that explains why). Marginal staining doesn't necessarily mean the composite needs replacing. Obviously if the composites are in the aesthetic zone and this bothers the patient it would be best to replace them, however if there is no evidence of caries both clinically and radiographically, you can monitor them instead of jumping in and replacing them. I would recommend clinical photos be taken to properly monitor the restoration. There are some not so credible dentists out there offering dentistry on the cheap and even more questionable treatments being carried out abroad with little or no after care being provided when back in the UK. So many people grind their teeth; whether they are aware of it or not. Treating a lot of patients who work in health care, many report being stressed or tired out which may contribute to their bruxism. Scalloped tongues as well as characteristic bite marks along the occlusal plane in their buccal mucosa point towards a bruxism habit, as well as tooth wear and reports of aching jaws or headaches. See a previous post which outlines the prevalence of bruxism among people who work in London. This is probably the most obvious thing out of the list; however, in the demographics of my practice mean that tooth decay isn't the most common thing that I see - although I do see it often! And a lot of the time when I see caries I don't immediately reach for my drill. The idea of Minimally Invasive Dentistry is becoming ever more popular and there is good evidence out there to support it. Of course, you can only remineralise tooth decay up to a certain point - the case in the photo below wouldn't really benefit from fluoride varnish application alone. For more information about minimally invasive dentistry, see my previous post summarising a conference I attended with Professor Banerjee here. Do you see these things commonly in practice? Is there anything else you see regularly? Please leave your comments in the section below!